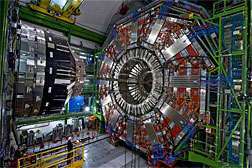 Scientists working on the CMS experiment at the Large Hadron Collider have confirmed the existence of an odd, puzzling particle first observed a few years ago at DOE's Tevatron particle collider. Members of the CMS collaboration announced on Nov. 14 that they had spotted the curious object, dubbed Y(4140), which scientists had discovered at the CDF experiment at Fermilab. The particle has a mass of 4.1 billion electronvolts (GeV) and seems to be related to a handful of X and Y particles previously found at other laboratories. These particles are well measured but poorly understood. They don't fit the common pattern in which quarks and antiquarks bind together to form protons, neutrons, pions and other particles. Some theorists think that X and Y particles resemble molecular structures. Perhaps they are made of two quark-antiquark pairs bound together for a short period of time. Or they could be something completely different. With additional data, CMS scientists hope to understand the exact composition of the Y(4140) and get to the bottom of this mystery. The particle has a mass of 4.1 billion electronvolts (GeV) and seems to be related to a handful of X and Y particles previously found at other laboratories. These particles are well measured but poorly understood. They don't fit the common pattern in which quarks and antiquarks bind together to form protons, neutrons, pions and other particles….